Today I take a look at the newest dice sets from Q-Workshop. 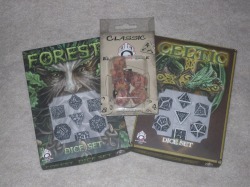 First up is the Forest 7-piece set, this set includes a D4, D6, D8, D10, D12, D20 and a D100. These feature leaves and bark sculpted on the face of each die, and as reviewed is a black and white set. Of all the dice in this set, only the D4 seems a little tough to decipher without a 2nd look. This is also one of the first new sets to debut the new packaging for Q-Workshop premium dice sets. The flat window box is quite attractive, and there's a flip up peg hole to hang these on pegboard at retail too. This set also comes in gray with black details, and in green with black details as well. Next up is the Celtic dice set, which I had mentioned and previewed in the previous Q-Workshop In Focus Review. This is also a 7-piece set, with a D4, D6, D8, D10, D12, D20 and a D100. These are really amazing looking dice. Each die face is adorned with Celtic knots and symbols, and this is the first set to use their new reverse etching technology (the 2nd is the Forest set). It too also comes in the new window box packaging, and is a black and white set as reviewed. All of these dice can be read clearly without a problem too, and at present it only comes in black and white. Last but not least is the new Classic RPG set of dice, which is also a 7-piece set with a D4, D6, D8, D10, D12, D20 and a D100 included. As reviewed these are translucent dice with red Elvish calligraphy to represent each digit on the die face. This set comes in the original Q-Workshop packaging, not the new fancy window box. 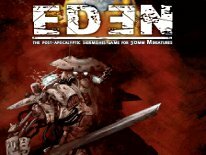 Additionally the new Classic line by design is meant to be their most affordable option for RPG enthusiasts yet. This set also comes in solid black with white details, and solid white with black details. There's also another translucent set with blue lettering as well. That's good news for everyone. My only gripe about Q-Workshop products in the past has been, that while these are fantastic dice, with detail unmatched by any other dice products I've ever seen, the prices needed to be lower for them to catch on more with the war/skirmish gaming crowd. With the announcement of lower prices, the future looks bright for Q-Workshop. I like the new packaging, and think it looks great, but packaging doesn't make a product good. It just helps draw more attention to a product at retail, and that's clearly what they're aiming for, and I think it will work. The premium Celtic and Forest dice sets are also two of the nicest looking sets I've seen from them yet. If you're into Celtic designs, or if you're into Ents from The Lord of the Rings, these are two sets not to be overlooked. Best of all, both sets are priced at just 13 Euro, which is $17 USD. That makes them about $2 less per set than previous premium dice sets from Q-Workshop. The Classic RPG set isn't the kind of set I'd personally get that excited about, but it's a nice looking set, at a great price. Being it's from the new Classic range it's priced more affordable than the premium Forest and Celtic sets at just 4.5 Euro, which equals just $6 USD. It's definitely an affordable option for the RPG enthusiast, who's looking for more than an average 7-piece polyhedral dice set. I'm now looking forward to seeing some of the metal dice mentioned in that video, and future dice sets in general that utilize the new reverse etching technology. Stay tuned for more on what Q-Workshop has to offer.